The 'Museum van Oudheden' in Rotterdam made an important purchase in 1918 for its ceramics collection when a house was demolished where until the middle of the 19th century tiles had been made. The house in question stood on the Schiedamschedijk in Rotterdam and on its facade was a tile panel which for nearly two hundred years has served as a factory sign. Before the house was finally demolished it served as a warehouse. During this time the panel, measuring 6 x 5 tiles, was damaged. Already in the year 1876 J.H. Scheffer and F.D.O. Obreen described the panel in Aanteekeningen Betreffende Rotterdamsche Kunstenaars (Notes Concerning Rotterdam Artists as "the last memorial to a once flourishing factory workshop". In 1904, E. Wiersum, chief archivist of the Rotterdam Municipal Archives wrote in his account of Het Archief Van De Firma Van Traa, Steenhouwerij en Tegelbakkerij te Rotterdam (the Archive of the Firm Van Traa Stonemasons and Tile Makers in Rotterdam), who were the last owner of the factory 'De Bloempot', the following: "Van Traa bought the backend of the house on the Schiedamschedijk, on the eastside, where for over two hundred years a famous tile factory had been in operation. At present this house number 172 is in use as a warehouse by Ch. de Sterke. 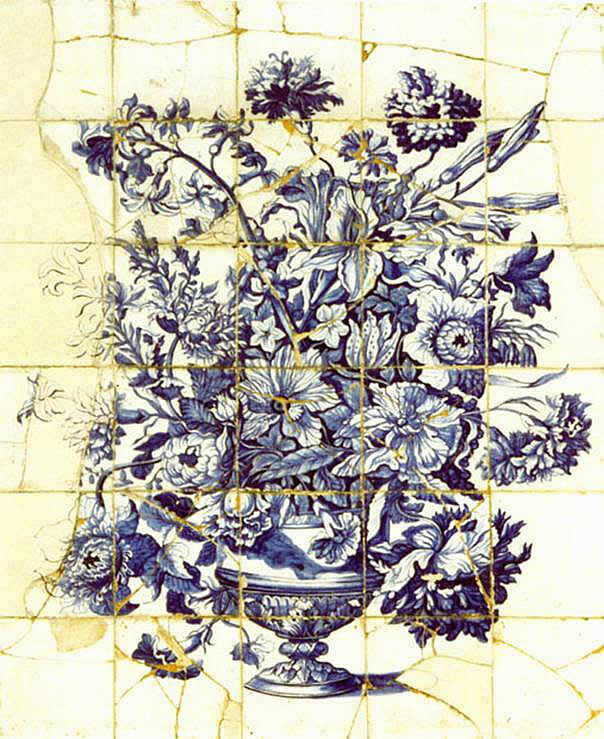 The tile panel that is still in place on the facade depicts a vase with flowers, which although badly damaged, would make a welcome addition for the Museum of Antiquities in Rotterdam". which served as the design source for the Bloempot tiled factory sign. The design of the tile panel is based on an engraving by Carel Allard (1648-1709) who ran a print business in Amsterdam. 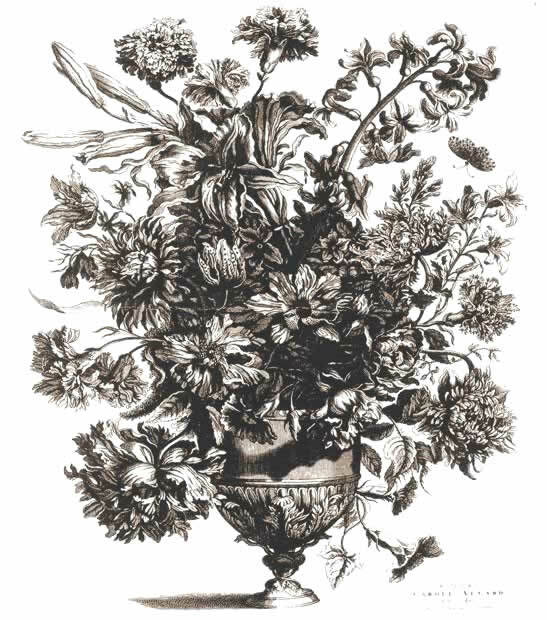 In turn, his engraving is based on a flower painting by the Amsterdam artist Cornelis Danckerts (1664-1717). The flowers depicted range from carnations to hyacinths and chrysanthemums to lilies. The Aalmis family which owned the Bloempot tile factory in the 18th century supplied many tiles to customers abroad. Panels with similar early 18th Century flower pieces as seen on their factory sign, were much in demand. They can still be seen in the Summer dining room at Schloss Augustusburg in Brühl, Gcrmany and in a fireplace at John Knox's House, Edinburgh, Scotland. With the permission of Mr. Hans van Lemmen and the Tiles & Architectural Ceramics Society.